Picked up these 2 ribbon bars recently. Although I'm not familiar with Romanian ribbon bars they look good to me. Any thoughts on these? Pre war Romanian medal or ribbon bars are far from common. I cannot help you with your question, but perhaps someone else here can? Regardless, nice find! I hope that my post doesn't come to late. the ribbon bars dont belong to the same person or is a low chance that to happent. 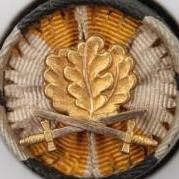 the first ribbon bar, belonged to a military person, an officer. 7. 25 years in military service. obvious a miltary personell ribbon bar. 9. medal for comercial and industrial merit, 1912-1947.
both are looking good and original. To be more acurate in my opinion, the large bar, is both military and civil, to an old soldier, who started his career by going on the 1913 Balkan Campaign, its very possible the person was a military doctor and at number 3 possibly from Italy, the Order of the Crown. the decree allows its award to medical staff who saw service in the front lines. The Romanian Commemorative Cross of War would back this up as well. One thing I have noticed in Romanian ribbon bars and medal bars from studying period pictures and medal bars in the Romanian Military Museum, scant regard was paid, back then to the regulations with regards placement and the wearing of all ones awards, I have pictures where the same man sports his medals singular or in a group, even high ranking officers were laxadaisical in this regard. On the second bar, at #3 - if romanian - is a Reward for Teaching Medal - but I've never seen it with an officer rosette. There might be an austrian medal with the same red with white stripe ribbon.